It’s back to school time! For mums (and dads) that means back to packing lunch boxes, morning rush and all that goes with it. When it comes to breakfast, we need something that kids love to eat, quick to prepare, possibly warm (especially on cold mornings) and versatile: pancakes! Note: To memorize this recipe easily, just think “2“: 2 C SR flour, 2 eggs, 2 C buttermilk ! Pour buttermilk and eggs mixture into dry ingredients and mix all quickly into a thick batter with a whisk. By adding half the required liquid first the batter will be smooth and without clumps. Buttermilk pancakes are thick and spongy with less fat needed to achieve the softness. I had been using a very basic recipe of my mothers for years, but I wanted something different for my daughter’s birthday breakfast. The buttermilk worked a treat they tasted great. I will be using this from now on. Thank you for your feedback Colleen! This was a great recipe, I’d never used buttermilk before and I made this into a really yummy savory brunch treat. The pancakes were thick and fluffy. Thanks. Next post is going to be Buttermilk Scones. Delicious! I didn’t oil my pan before frying the pancakes as they had oil in them anyway and they turned out fine and didn’t stick to the pan. I used olive oil to make them healthy. I also didn’t add sugar even though we had them as sweet pancakes so they were nice and healthy and nobody complained about the missing sugar. Great recipe! I love cooking and think this is a great no fail recipe…fluffy easy pancakes! How many approximately does this recipe make? It depends on how big and how thick you make each pancake. I never actually counted them as my kids eat them as I bake. beautiful recipe! I cooked them for my younger brother and he says it was just like the ones from the shops. Nice and easy and would say the butter milk makes the difference. thanks. Because your pancakes are homemade and cooked with love, they are way better than the shop bought ones! Sounds great! Can I freeze the extras? Will that affect the fluffiness please? My first buttermilk pancakes! You can freeze extras Yen, however, I’m not sure how they taste after defrosting or wether freezing affects the fluffiness. If I have a few extra (that rarely happens), they are eaten on the next day. Cheers. You’re welcome Robb! Thanks for your feedback. Upside down fruit “pan” cake – sounds delicious! Fantastic recipe! Pancakes came out nice and fluffy! They’re going into my daughter’s lunchbox for kinder tomorrow! Thank you for the recipe! Thank you for your feedback Katie! Buttermilk pancakes are often in my kids lunchboxes, too. Sometimes I add fresh or frozen berries, chopped greens or grated sweet potatoes. Enjoy! These are beautiful, fluffy pancakes. What a great, simple recipe, and one that is now my ‘go to’ pancake batter. Thank you for your feedback Lauren! Happy baking. When I was a kid in the 80s I can’t recall anyone using the word crepe. We made pancakes according to an old recipe in the Australian classic Golden Wattle cooking book and they very definitely used plain flour, were thin and took up most of pan and were best eaten with butter and sugar and lemon. Apparently we’ve since adopted American definitions and now pancakes are no longer as flat as a pancake but rather as flat as a fluffy pikelet. It’s probably a losing battle but I’ll be buggered if I’m going to call those small fat things pancakes even if they are delicious. Thank you for your insight, it’s interesting how things are changing. 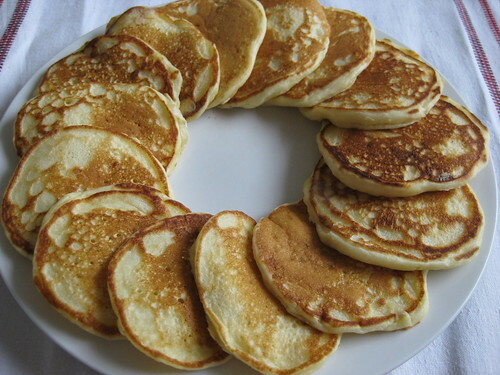 Growing up in Europe, the only pancakes I knew about were the thin ones with plain flour, too. However, to avoid confusion, I used therm crepe and pancakes in the recipe. As you, I still call crepes – pancakes. I really liked this recipe! Very easy to make and the texture, flavour and fluffiness was just right. I prefer to add less salt to pancakes, so I only added 1/8 of a teaspoon. I also added 2 tablespoons of caster sugar, as suggested. Thank you for your feedback Emma! It’s easy to adjust the recipe to your taste as you did. Enjoy.